Former Space Shuttle technician moving on. Artist, photographer, inventor, Space Tweep Society founder, Yuri’s Night & Fragile Oasis contributor, Rocketopia CEO. When I was in the ninth grade, I had to do a science fair project. Somehow, it was chosen as a regional winner and I was selected to go to the International Science and Engineering Fair, which was held in Tulsa, Oklahoma that year. One of the traditions at the event was that participants would bring tiny pins representing where they were from to trade with others. Some were representative of a city, some a state or even a whole country. 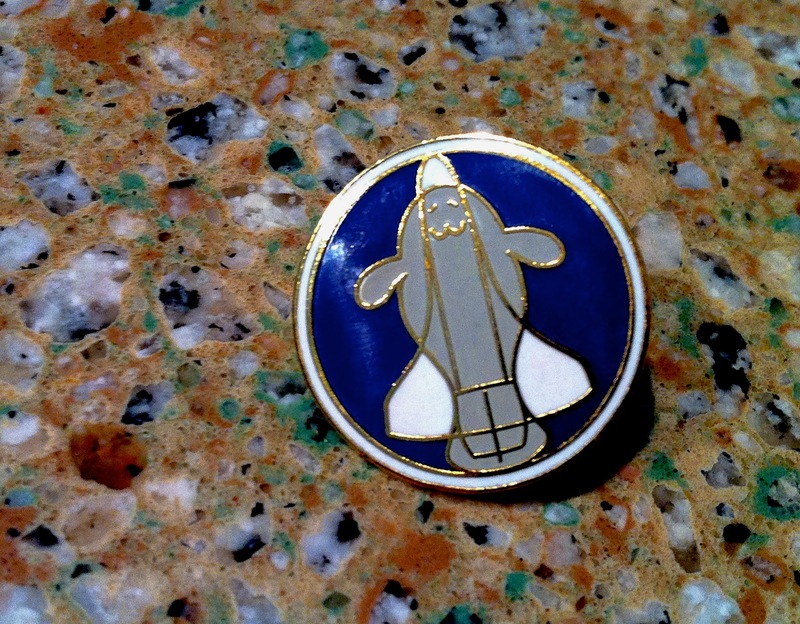 The pin in the photo above was given to me by another student at the Science Fair who lived in Merritt Island, Florida, which coincidentally is where I live now. I started thinking this might be a neat practice for attendees of NASAtweetups or ESA Spacetweetups to adopt. It could help to facilitate conversation and encourage tweeps to meet as many of the other participants as they can, so they can collect all the different pins from their tweetup group. They could even put a spacey spin on it, finding pins representing a local planetarium, space museum, astronomy club, or or other space-related venue or group. Maybe some of these establishments or organizations would even be willing to donate the pins to tweetup participants to hand out and trade with others? It couldn’t hurt to ask. So, upcoming tweetup attendees, what do you say? Should we try this out and make it a new tradition? Ever since the scarf I made was posted on Craft:, I’ve been getting requests for the pattern, so I thought I’d post it here. This scarf can be made by either crocheting or knitting. I crocheted mine, but don’t let that stop you from making it as a knitted item. Don’t know how to knit or crochet? Don’t let that stop you either. I learned how to crochet by watching YouTube videos and you can too! The instructions for making this scarf are simple, but you’ll find that it is very much an art, so your results may vary. To begin, either crochet or knit using a simple tight weave stitch starting with the lighter shade of yarn. The entire scarf will be wet felted after it is crocheted or knit, so allow about 30% extra in size because it will shrink considerably. I crocheted mine using an ordinary single crochet stitch, but I’m sure a number of other knitted or crocheted stitches would work just as well. The width/length of the scarf is completely up to your own judgement, which is probably much better than mine. I’m a Florida native- what the hell do I know about scarves? I’ve never worn one in my life! Anyway, get started crocheting or knitting with the lighter shade, and then you will have to consult your image of Jupiter and where appropriate, switch to the darker shade of yarn to create the dark bands. You may have to pull lengths of yarn out from the variegated skeins to get to the colors you need. Wrap these lengths around yarn bobs so they are handy when you need those colors. Again, totally a judgement call- this is what art is all about! Once you get past the dark bands of Jupiter and basically up to the lighter portion above the bands, finish the remainder of the scarf with the lighter variegated yarn. When it is completed, weave in any loose ends of yarn with the yarn needles and place in the washing machine for felting. 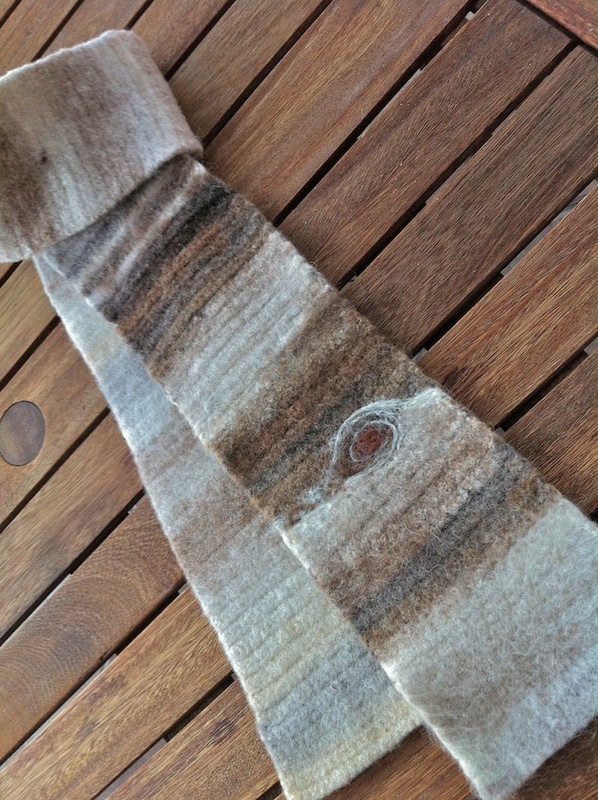 To wet felt the scarf, you’ll need to wash it in hot water with detergent, probably several times. It helps if there is something else washing with it, because it increases the friction needed for felting, but don’t use something like a towel or anything that will leave lint or residue. I did that once and had little bits of white towel in my felted piece- not good. Also don’t wash it with anything you wouldn’t normally wash in hot, because it may shrink as well. I believe I had to wash the scarf either three or four times to get it to the desired level of felting; your results may vary. Note that it will be very fuzzy when you pull it out of the washing machine- but this extra fuzz will be shaved off. When the wet scarf is felted to your satisfaction, take it and stretch it out flat. Use the clippers to shave off the fuzzy fibers sticking out all over it on both sides. You will want to “block it” or pin it down in this flattened, stretched out shape to dry. When it is dry, the final touch is to needle felt the wool roving to create the great Great Red Spot, using the foam block to stab into. Don’t worry if you haven’t needle felted before- it is easy. There are lots of instructional videos on YouTube to show you how it is done (stab, stab, stab!). Beyond that, I can’t instruct you much. It is art and you must render it as you see fit. For those who don’t know me, I have worked in aviation and aerospace for the past decade. In October, I volunteered for a layoff from my job as a technician on the Space Shuttle Program, as it is coming to an end soon. I am very much a space advocate, and have been using Twitter to share my enthusiasm for space for over two years. I am also the founder of the Space Tweep Society, a growing group of space enthusiasts on Twitter. Due to that role, I am often asked to participate in interviews or space outreach activities, many with the goal of encouraging girls to pursue careers in science or technology. This has me feeling quite conflicted because I’d love to have more women in aviation and aerospace, but in my experience breaking into these fields was really rough. I almost feel guilty for encouraging them, knowing what kind of obstacles they may face. 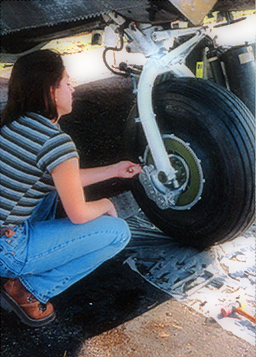 Why is it that in this extremely liberated day and age that there are still so few women in the field of aviation maintenance? According to the Federal Aviation Administration’s data, only about two percent of all licensed airframe and powerplant mechanics are women, and it seems that even fewer actually work as mechanics. Perhaps many have been lured away by other careers or family obligations, but I believe most are pushed away from aviation due to the challenges they face while trying to break into this solidly male-dominated career. Since I have been in working in the field of aviation/aerospace maintenance I have always wished that one day, when I start a new job, that they wouldn’t have to hold a meeting with all of my new co-workers before I got there telling them that a female was going to be working with them and that they had to start watching what they said and did and clean up their act. It is no fun being the pioneer, paving the way for other women to come along. In one of the places that I worked there was not even a women’s bathroom in the hangar, but there was a large men’s bathroom and locker room. That building was built as recently as 1983; apparently even at that late date the company had no reason to anticipate they would ever employ a woman mechanic. Amazing. My first real taste of aviation was just before my nineteenth birthday. I was in college at Florida State University and I saw an advertisement for introductory flights with the FSU Aviation Club. I took my intro flight on a breezy Halloween day, 1993. My flight was in a Cessna 150, a two-seater owned by the aviation club. I was instantly hooked. I started taking flying lessons as often as I could afford. My grandmother was helping to support my interest and I was volunteering my time to keep the club’s aircraft clean and the interior in good repair in exchange for flight hours. I really liked just being around planes. I tried to get a part time job washing airplanes at the small maintenance shop where the club’s airplane went for service, but the owner told me “No, because if I hire you, none of the mechanics will get any work done.” He hired a high school boy with no experience around aircraft at all instead. It wasn’t until a few years later that I decided that I was more interested in how aircraft worked than I was in flying them. At the time I thought I would like to pursue a career in warbird restoration, particularly in re-creating the elaborate nose art that made each plane so unique. I decided to enroll in school to obtain my FAA Airframe and Powerplant Mechanic’s license. There was a small school for this in Tallahassee, where I was living that had been in existence since the 1940s and had a wealth of equipment to work with, although some of it was truly ancient. I loved it. I was learning about combustion engines, gear ratios, aerodynamics, etc. I faced a little more difficulty than many of the other students in that I had no mechanical background. Many of the students knew a lot about cars, and understood the similarities, which made things easier for them. I had never really worked with anything mechanical before; my dad could hardly be bothered to take his car in to have the oil changed, so needless to say I didn’t have anyone showing me things about cars or anything mechanical. Fortunately my instructors were very knowledgeable and very good at imparting their wisdom to me and I didn’t have too much trouble understanding the things I had to learn. When my classes were all completed, I began the rigorous testing process to earn my Airframe and Powerplant mechanic’s license. My first job in aviation was with the Cessna Aircraft Company in Wichita, Kansas, where I was employed as a flight line mechanic at the factory where they built their business jets. I set out for Wichita on January 1st, 2000, the day that all the computers in the world were supposed to stop working due to Y2K. Obviously that didn’t happen and I arrived in Wichita the next day. Orientation at Cessna was an all day affair where we heard all of the usual topics such as attendance policy, rules, and benefits and we filled out all the necessary paperwork and forms. Then the Union people came in and gave their extensive sales pitch, making sure to let us know how easily we could be fired during our probation period. After that, I was shown to the area I would be working in and introduced to my shop foreman, who was pretty young and not at all scary. I was quite relieved. He took me on a quick tour of the factory and to meet a few of my new co-workers. Then my orientation was over and I was told to report back on Monday for second shift. My first day on the job, I was assigned to work with a mechanic named Justin, a long haired, loud-mouthed young guy in the shop. He was very nice, and told me that both of his parents had been aircraft mechanics and many times he had seen his mother come home from work crying, due to various struggles on the job. Justin was born to work on airplanes; he could contort his body to access areas of them that were almost impossible to get to. He claimed that a bicycle accident at age ten had left his rib cage slightly flattened, which allowed him to squirm into very small compartments. It was a good thing that I befriended Justin early on, because he stuck up for me later when things went awry. It was not long coming. On my third day on the job, I was told that a certain mechanic in my shop, Jim, had said some very nasty things about me in front of a group of about eight of my co-workers. No one would tell me exactly what he said because it was too horrible, I guess. The funny thing was, I had never met Jim, never spoken to him, and I didn’t even know which one he was- someone had to point him out to me. Needless to say, my feelings were hurt a lot to know that there was so much hostility directed toward me when I had done nothing to elicit such a response. I did not dare say anything to management about the incident though, because first of all, I am not a crybaby and I like to handle things on my own, and second, because the Union people had drilled into us at orientation that we had better not do anything to attract any attention to ourselves or we would be out on our asses; no one likes a troublemaker. It seems that this was not the first incidence of Jim bullying someone. He regularly spoke disparagingly of women, youth, and foreigners; he was truly threatened by those different from himself, and spoke loudly about their inferiority to anyone who would listen. Finally one of my co-workers had enough of Jim’s crap and reported the incident where he slandered me. After the episode was reported, it swiftly escalated through the HR department, and by the end of the shift the company lawyers were interviewing me. I didn’t have much to tell them considering that I had never met Jim. He was sent home indefinitely. Over the next few days, the company lawyers took statements from my co-workers on the current issue and a host of past issues they had with Jim that had been going on for years. To complicate things even more, he had joined the Union the day the trouble with me had started, and immediately he filed a grievance against me. The Union was forced to investigate the grievance and defend him as a member of the Union and they came to interview me about it. Considering that I had never spoken to the man, the investigation was dropped fairly quickly. After all of the chaos, I was told that I would not have to work around Jim, if they ever let him come back to work at all. It turned out, that this was not the case. A few weeks after the fact, he returned to work, and during the shift tie-in meeting he glared at me from across the break area with a snarl on his face. I tried my best to ignore him, but I didn’t feel at all comfortable in the situation. One of my co-workers noticed that Jim was trying to intimidate me, and decided he’d had enough of the guy’s antics. He reported it and the next thing I knew, the company lawyer was back. Jim was sent home again and this time he didn’t come back, at least not to my department. Things calmed down a great deal after that, although I did have one of my tires slashed in the parking lot at work and one of my co-workers who had testified against Jim had his car’s side window smashed in the same parking lot. Months later we heard what had finally happened to Jim. He had been allowed to return to work, only in a different department and was placed on probation. He continued to cause problems in his new area, and finally was terminated and escorted out of the building. He then proceeded to peel out of the parking lot, lost control of his vehicle and hit a couple of parked cars. The police were summoned and escorted him off the property. It couldn’t have happened to a nicer guy! I don’t know what it is that could possibly cause a person to be so prejudiced against someone they don’t even know that they would sacrifice their career over it. Jim couldn’t stand the idea of a woman doing the same job as he did and it eventually ruined him. I can’t imagine how someone could treat a woman he’d never met in such a manner, especially since he had a wife and daughters at home- how would he feel if they were put in a similar situation? I hope his wife gave him hell when she found out what he got in trouble for. Any decent woman would. I would like to say that after this one hurdle that the rest of my career in aviation went smoothly and that issues like this didn’t follow me when I transitioned to aerospace, but I cannot. I faced many more challenges after this one, though I also have met many great people and had a lot of fun along the way. It is certainly not a career choice for women who are faint of heart! Note: I am posting this because I want people to see a realistic view of things at NASA, not a sugar-coated version. This is as real as it gets. This week I volunteered for an upcoming layoff from my job as a space shuttle technician. I will be leaving after 8.5 years of service on October 1st, 2010. Since many people would give their right arm to work on the shuttle program, you might think I’m crazy to volunteer for this. 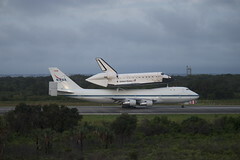 Leaving the shuttle program is a tough decision for sure, but it really isn’t a matter of if, only when. I am not choosing to leave, I am just choosing the time it will happen. Ultimately, the vast majority of shuttle workers will be let go. So why go before I am forced? Here’s an explanation so you can see it from my perspective. One of the biggest reasons I am taking this layoff is that it will allow me to plan for my future. It is nearly impossible to make plans or look for a new job when you have no idea when your end date at work will be or what the future holds. We hear a different story every week about what is happening with the program, or with our benefits/severance. The uncertainty is exhausting. I’m not blaming my management for this- I think they are in the same boat. By volunteering for this layoff, I now know what is going to happen to me and when. Crazy as it seems, that feels good. Now I can start figuring out a good strategy to move forward. Along the same lines, morale was a big push for me to self-nominate for this layoff. You can’t imagine what it is like to be at work surrounded by constant doom and gloom, now with a dash of panic. It is not pretty. Once the people who are to be laid off involuntarily are notified- which will be at the end of July- I expect that it will be even worse. As far as the work goes, we are finishing up with Discovery’s right OMS Pod now, and will deliver it for reinstallation this week. After that I have a few thrusters to bench test for Atlantis, which is being processed for launch on need (in case of emergency). Once that is complete, the bulk of the work we will have left in my area is decontamination of our facility for shutdown, or Transition & Retirement as NASA likes to call it. I started working on the shuttle program because I wanted to contribute to something incredible, human space exploration. I don’t find decontamination and shutdown very inspirational. In fact, it is downright depressing. For many workers, it is just a job and they don’t care what goal they’re working towards as long as they are paid. To me, it makes a difference, and I would much rather try to find work I can feel good about again. Other reasons for taking this layoff are more practical than emotional. Leaving early gives me a better chance of finding a new job or pursuing other options because the market won’t be flooded with thousands of others doing the same. Also, it makes sense for my particular situation, because my husband works on the shuttle program as well. He will have work to do up until the last launch because he works at the launch pad. We figure that it will be best for us to take a phased approach rather than both being laid off at the same time. This way, hopefully I can get something figured out and can carry him once his job is complete, sometime next year. I frequently get asked what I think about the direction NASA is taking. I wrote this post a couple of weeks ago but didn’t post it at the time. I’m not really sure why. This post does not outline my personal take on what we should be doing with our space program; it just provides a little bit of perspective on things from where I sit. After the president’s visit to Kennedy Space Center last week where he laid out the emerging plan for NASA to go forward, I’ve noticed a fair amount of negativity in the space community. Personally, I have high hopes for our nation’s future in space. It isn’t because anything particularly revolutionary was disclosed at Obama’s Space Summit. My perspective has just changed gradually over the past year or so, and a lot of that I owe to my interactions on Twitter. I used to look at space exploration very narrowly. Like this is the way we go to space, and this is the right way and the only way. And this is how it has to be (I’m exaggerating, but just go with it). I looked at the changes to the program more in terms of how they affected me and my community. Now, after quite some time on Twitter, I have much greater knowledge of commercial space operations, robotic missions, and international perspectives. Because of this I am able to take myself out of the equation and look at the plan more optimistically. It has made me start to challenge the traditional thinking that is ingrained in us about NASA’s role and see more of a big picture view. Seeing Discovery land today reminded me how impressive the shuttle is as a launch vehicle, and how sad I’ll be to see the program end. That being said, if we waited another five years, ten years, or even more to retire it, would it be any easier? For me, the answer is no. 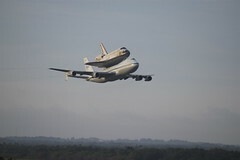 The shuttle is an icon, a symbol of pride, and a treasure. It is going to be hard to see it go no matter when it happens. And there is no denying that as time goes on it would become more difficult to maintain due to issues like aging hardware and availability of spares. So, while I might not be ready for shuttle to end, I probably won’t ever be, in the same way I would never be ready for a loved one to die. It will be a time to grieve and then move on. 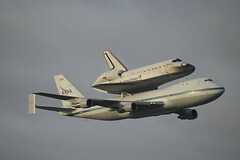 I have heard the argument that it would be easier to lay shuttle to rest if we had something better coming along. Ares-1 might have filled that role, but there were funding issues. So now we’re trying something different, with a greater emphasis on commercial spaceflight roles. Our destinations are different, and we aren’t quite sure what kind of vehicle we will be using to get to them. But we’re going SOMEWHERE. We have a commitment to develop a heavy-lift vehicle. These are steps in the right direction, yet they don’t seem to have been met with much optimism. Of course, people have every right to feel the way they do and to question the decisions. Personally, I’m choosing not to. I just don’t see the point. Regardless of what I think is the the right path to take, I’m not the one who gets to make that decision. Rather than expend energy fighting it or fretting over it, I’m going to accept the new plan for what it is and be hopeful. I’m going to look around for new opportunities arising from it where I can make a difference and seize them, or create my own. I’m going to savor everything about the last few shuttle missions, and remember the program fondly. Overall I see that there is potentially a bright future out there for NASA and space exploration, it just looks different than what most of us expected. A lot different. If we can approach the new plan with open minds, accept that there are other valid ways of doing things and embrace them, we can make the most of the situation. If, instead, we consider it a tremendous loss and spend our time wallowing in it, then it will most likely manifest as one. For me, it was a simple choice. Note: The intent of this post is not to express an opinion on the path that should be taken by NASA or its future programs. It is simply an observation from someone experiencing the end of an era. Have you ever had the feeling of grieving even before a loss? You see it coming and know there’s nothing you can do. Your senses are heightened to every little intricacy and you want to preserve all the details before it is too late. That is the way I feel about the Space Shuttle Program. 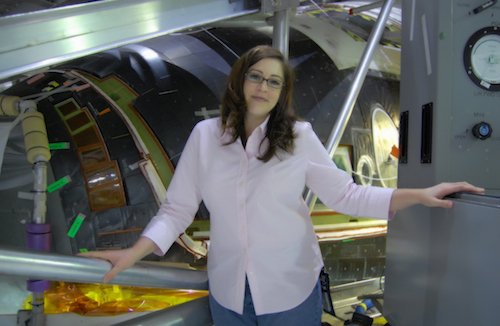 I’ve worked at the Kennedy Space Center in various areas for roughly the past eight years. That makes me practically a newbie to most of my co-workers, but it feels like a long time to me. Long enough for KSC to feel like home. It is strange and sad to think that it will all be over in a matter of months. Many people have never experienced anything like working at KSC. The center is sprawling; it has its own gas stations, banking, barber shops, and even a US Post Office on site. People out there speak a different language. When you first start working there, it takes several months before you have any idea what everyone is talking about. They speak in acronyms and in some cases the acronyms have become the words, because hardly anyone remembers what the letters stand for. KSC is similar to a small town, where gossip travels at speeds that far exceed a launching shuttle. With the Space Shuttle Program, there is much more to it than the end of a contract. It is the end of an era. Most of us have become accustomed to spending the better part of our waking lives there and it is coming to a close. Everything we have come to know as so familiar will be gone, never to be seen again. This will be different than leaving a typical job. When we’re gone, we can never return to the site, never visit to see how things have changed, never set foot on the property again. It is not only a loss of the program for us, but a personal loss. We will no longer see the buildings we spent so much of our lives in, working at all odd hours of the day or night, often on weekends and holidays. The orbiters & ground support equipment we shed blood, sweat, and tears over will become distant memories only to be viewed in museums behind ropes and glass. We will seldom cross paths with many of the people who have become almost like family to us; the co-workers who will be forced to leave the area to find jobs. For us, it is a tremendous loss. Even though I feel that I am ready to move on and pursue a career in space education and outreach, I can’t help feeling a bit melancholy about the end of the program. There are so many memories, good and bad. There is so much knowledge, expertise, and familiarity. Most of it would sound silly to anyone else, but the things I will miss include long days in the test cells working on welding jobs while listening to my co-workers tell stories from the early days of the program. I’ll miss riding in convoys to deliver Orbital Maneuvering System pods after our work is complete. I will even miss driving past the Gator Lake at the end of the road where we once saw forty-eight of the giant lizards laying up on the banks- as though it was an alligator parking lot. There are other memories as well. Memories of working on Columbia and getting to sit in the commander’s seat the summer before she was lost. Standing in the shadow of the massive Vehicle Assembly Building to view the launch. Waiting outside with binoculars ready for her to return and the horror of the silence that should have been filled with two telltale sonic booms. Attending a surreal memorial service on the Shuttle Landing Facility runway on a grey day, in a light drizzle with the missing man formation roaring overhead. Examining the wreckage, in awe of the forces that acted upon it. These are moments I’ll always remember. Now, as we near the end, I find myself looking around a little more, noticing and trying to take everything in. I’ll miss it all: the people, the hardware, the facilities, and the wildlife. It probably seems trite, but I don’t want to forget any of it, not even the little things. Not the chip in the floor at the bottom of the stairs in the test cell that I’ve always thought looks like a dragonfly, or the sound of thrusters when I test “fire” them on the bench, or the pain of AC motor valves jabbing me in the back as I squeeze into places never designed for human occupation. Okay, maybe I could forget that last one. Heh. Whether you are a fan of the shuttle or not, you must admit that it is iconic. It is instantly recognizable, a beautiful machine and a work of art. 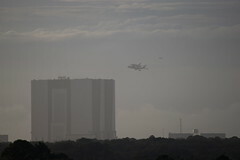 It is tough to come to the realization that after this year, we’ll never again see a shuttle stack rolling out to the launch pad or leaving it in a hurry atop a billowing plume. For those of us who have lived and breathed it for years, please forgive us if it makes us a little sad to see the end. To us the shuttle is so much more than the sum of its parts and we’ll truly feel the sting of losing it and the community we’ve become a part of. It is going to be very hard to say goodbye. After yesterday’s launch scrub for STS-127 due to weather, I was listening in on some of NASA’s press conference on NASA TV. One of the reporters asked about the weather criteria, if they were perhaps too strict now that we have more advanced methods of assessing weather conditions than we did when the criteria was developed, or something to that effect. I don’t remember the answer Mike Moses gave, but the question made me think. While it is very easy to get frustrated over strict weather criteria when it hinders a launch and the weather is borderline, that line has to be drawn somewhere. Pilots are all too familiar with the concept of “get-there-itis,” which is used to describe the affliction when someone is so fixated on getting where they are going that they take unnecessary risks to get there. These risks might be with weather, fatigue, or even mechanical issues. I remember an experience many years ago as a student pilot flying with my instructor from Pensacola back home to Tallahassee. We were flying a 1966 Cessna 150 by VFR or visual flight rules, meaning we were navigating by sight rather than instruments. The plane was not certified for instrument flight, so that was our only option. VFR flight requires certain weather and visibility conditions and we were okay in Pensacola, but it didn’t look good in the direction we were heading. We probably shouldn’t have left Pensacola when we did, but we were anxious to get back so we took off and headed back home. As we traveled, the clouds went from scattered to not-so-scattered and by the time we got to Destin (about a quarter of the way home), we were having to fly so low to stay beneath the ceiling we could practically read the street signs. Fortunately, we were able to land at Destin and wait out the weather, but many are not so lucky. So often the desire to get somewhere overcomes rational decision making, leading to the pilot’s demise. And pilots are only looking to get home or to wherever they are going- imagine how much the get-there-itis is amplified when the destination is a mission to space and people all over the world are watching expectantly. 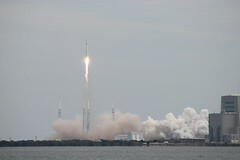 Just think- if the weather criteria for launch were not set so firmly, it would be easy to rationalize launching when weather was just a little beyond the guidelines. If that works out without an issue, then the next time it makes sense to allow weather that is a little farther out of specifications, and so on. It is a slippery slope. Without strict criteria, pretty soon we’d find ourselves taking unnecessary risks. We can’t let get-there-itis cause us to make bad decisions. I will admit that launch scrubs frustrate me just as much as everyone else, and sometimes I want to yell, “Just light it off, already!” But I also understand the reasoning behind it and that it is the nature of our industry. Ultimately, I think everyone would agree that the safety of the crew is well worth the wait.